N.B. This post is mainly an excuse to show you lots of pictures, many of which will probably end up in the 'visuals' section of this website. Our driver was a short, skinny old man whose family was originally from Ibb and who used to take tourists all over the country in Yemen's better days. He clearly wanted to make this trip as much as we did, to the point where he slipped the Tourist Police a couple of thousand riyals so they wouldn't ask too many safety-related questions when getting the permission required to leave Sana'a. They didn't, they just made us sign a paper that we were traveling 'on our own responsibility' and off we went, with copies of the permit for every checkpoint we passed. Since the road to Ibb is basically the main highway to the south of the country, there are many big trucks and traveling both up- and downhill, making it something of a racing game for our driver to take over just before a turn in the road with no view of who or what was coming. Even more than in the Old City of Sana'a we were stared at by other people on the road, but we figured – if upon seeing us they don't pick up the phone to call ahead and tell potential kidnappers we're coming, we don't need to worry. I was told that Ibb was beautiful and green, but I wasn't prepared for exactly how beautiful and green it was. The road, initially brown and dusty, went across a mountain range with views over the most impressive valleys, the slopes of the mountains terraced and often covered in qat, coffee and corn. 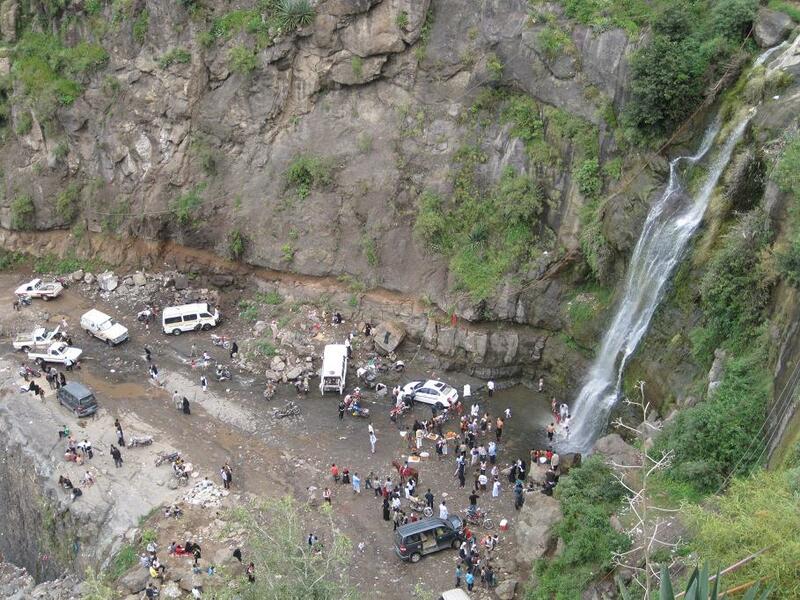 Ibb itself is situated in a valley and is a cute enough town, but the real attraction – judging by the number of Yemeni visitors – is the waterfall in the mountain just above it. Smart locals have attached long hoses higher up at the waterfall, so you can have your car washed while hiking up along the ridge. Many kids ran around under the waterfall, hair shampooed by their mothers. 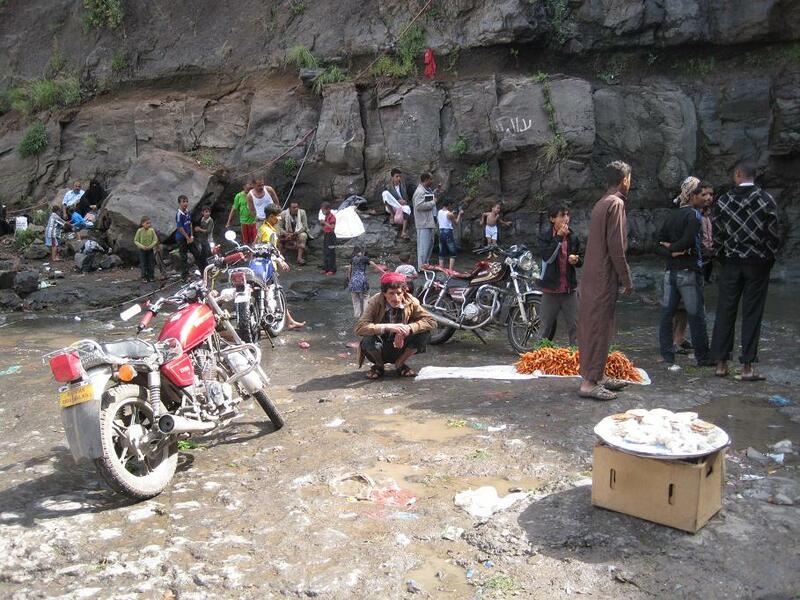 Others took the opportunity to wash their vegetables, or just drove through the cold, cold water on their motorcycle. When we went into the old center of Ibb, we immediately became its biggest attraction. Just as in Sana'a, the kids wanted to know where we were from, and have their picture taken. The adults wanted to know more: what did we think of the USA? Were we Muslim? If not, why not? Since we didn't have a sufficient answer to that last question, they insisted we embrace god and become Muslims. "It's good for you," one man assured me. Another stop on another mountain showed us Jibla, a town with a heavily graffitied presence of Real Madrid and Barcelona fans, but also a mosque of more than a thousand years old (according to our guide who popped out of nowhere and insisted on taking us into the mosque right at the time of the Friday-prayer, which we politely declined) and the castle of queen Arwa which supposedly had 365 rooms, one for every day of the year, but now lays in ruins. We ate with the women next to the kitchen on the top floor, while the men ate together one floor down. As they retreated to chew qat after lunch, we had tea, chocolate and chewing gum while trying to figure out who was related by blood, who by marriage, which kid belonged to which mother, and whether the 14 year old son of one of the women would be a good match for the cute, blushing cousin of the same age. The rest of the day we spent doing just what all other people from Ibb and surroundings seemed to be doing: finding the top of a mountain (or a close enough ridge on the side of it) and staring out over a beautiful valley, while chewing qat or drinking tea and eating cotton candy. 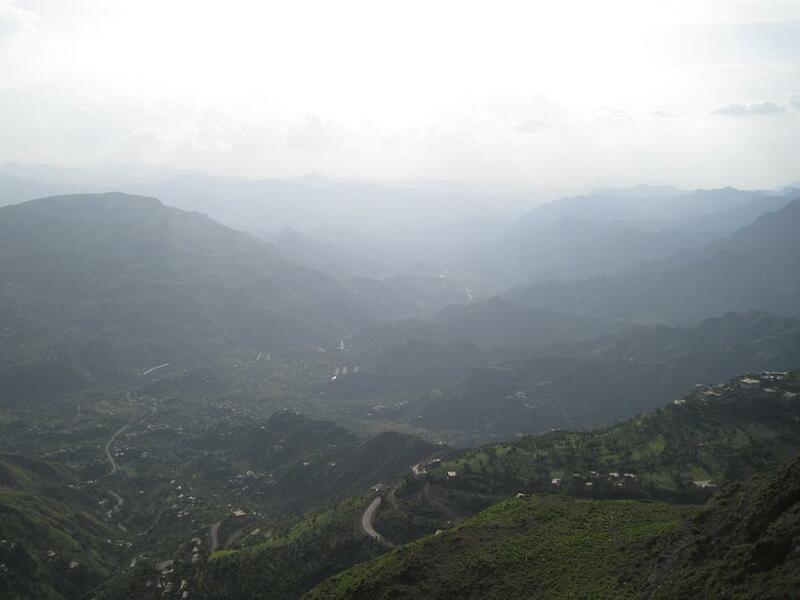 While I was sitting there contemplating life, I got company from two young women who had come to Ibb from Taiz and who told me all about dating in Yemen. Apparently, finding a good man in Yemen is not that easy, although facebook and whatsapp have quickly become essential in establishing contact between the otherwise quite rigidly separated sexes. Together with the girls and their mothers we watched the sun set behind the mountains, and decided that Yemen is definitely a beautiful country. *Another friend told me that Yemeni women are the most beautiful on earth. I asked him how he knew. Oh, he said, what do you think us boys are doing when we are still young enough to be put with the women and children… we soak up the beauty of the women and we never, ever forget! Every city has its own rhythm. The Old City of Sana'a has silence at 2am and 6am, and a lot of noise the rest of the time. But even in chaos there is order, and it didn't take me long to be able to tell the time by the sounds of a typical day in Old Sana'a. Starting at 4am (or sometimes a little earlier), there are the mosques calling for prayer. (Big cultural shock: in Lebanon, the mosques sing – generally a pleasant sound to wake up to. Here in the old city, they squeal like animals being slaughtered.) There are a lot of mosques, and some of them will also broadcast the sound of the men praying together, so the murmur of hundreds or thousands of men fills the air for a good amount of time. Before and after that, I will hear the men chatting on their way to and from the mosque, sometimes on motorcycles honking to warn people walking in the narrow streets. The Old City of Sana'a at 6am. When the first shops open, it is usually just before 7am. This is also when the wild cats start screeching at each other and the first children will quietly walk to school. In the hours that follow, the kids will start calling each other from across the alleyway, the motorcycles will add music to their honking (most of them have a radio installed between the seat and the handlebars), and the dogs will bark happily along. The guy who picks up and sells bottles of gas for the stoves passes by, banging his wrench on the bottles in the wheelbarrow to let people know he's here. For lack of doorbells (and/or electricity), people rely on doorknockers to announce their visit to the neighbors – and if those on the third or fourth floor don't hear them, screaming someone's name multiple times will usually do the trick. Most little shops close again at the next prayer time, but the sound-level remains more or less constant until around 1 or 2pm, when the schools go out and the streets are filled with kids running home: lunchtime. This is also the prelude to qat-time: the hours in the day when life slows down because almost all men are lying sideways on pillows and mattresses inside their shops or, better yet, at the top floor of the building with a beautiful view, chewing the green leaves until their cheeks seem to pop out of their faces. Those who don't chew and work at the same time often leave their children in charge of the (market) stalls, but others close their stores completely. It is not until just before sunset (6pm) that most men come back to their shops. Slowly the streets will get emptier again though, because the darker it gets, the less women there are out and about, leaving only the men and the boys and girls on the streets. Although empty is not the right word in a city with houses so close to each other and streets so interconnected that there is always a kid playing football or a little shop selling cookies and washing powder just around the corner. The evening, then, especially in summer (so I've been told), is for weddings, and weddings means fireworks and gunshots – my favorite part of the day. After that, it's screaming kids, chatting men and honking motorcycles, then silence… until it all starts again. Yesterday night, walking home from a friend's place, I was waiting behind two motorcycles trying to pass each other when a woman grabbed my arm and pulled me to the side. I didn't really realize what was happening until we were a few meters further down the dark but still busy market, and she said to me "we walk together, it's ok." She asked me the usual questions – what's your name, where are you from, what are you doing here – before dropping me off at my front door and disappearing down the side-street. Not even 30 minutes later I got a text message: "Reports of kidnapping of a foreigner on Al Zubayri Street at 8pm this evening. ID as yet unknown. Are you guys at CALES ok and accounted for?" It's a strange thing, this whole threat of being kidnapped for the simple fact that you are foreigner. It's a danger you can't feel, it has no presence, and because there is no real discernible pattern (in terms of location, timing, number of people around) it is not really something you can estimate and avoid (other than by not going to Yemen of course. To which I say: pah!). In the first few days, I hardly dared to interact with people (mostly men) in the street, because I wanted to avoid the question "where are you from?" Then I realized that a) potential kidnappers will probably draw their own conclusions from my height and the color of my hair and not wait until they confirm my nationality, and b) being in Yemen was going to be very boring this way. So I've been answering most "helloooo, welcome to Yemen"-s with at least a smile, and the follow-up question (indeed: where are you from) with the half-truth "Lebanon and the Netherlands". This usually confuses people because they unanimously think I look French, but that aside it's been nice to actually talk to people. Although it's often limited to "hi! My name is [Ahmad/Mohamad/Hassan/…], where am I from? * Thank you!!!" it takes away the feeling that everything and everyone is scary and out to do me harm. Especially when a wrinkly, almost toothless old man screams "I love you!" just as he passes me. However, I've also had little kids throw stones at my back a few times, and the guy from the small bakery around the corner starts screaming the political slogan of the Houthis – "death to America, death to Israel" every time I pass by. The kids stop throwing as soon as I give them an angry look, though, and the baker smilingly sells me his bread, so it seems more show than serious. It's also easy to forget that almost half the population always carries a weapon – the jambiyah looks like a pretty decorative item on every man's belt, until you see a guy pull it out and threaten someone else with it in a heated discussion. So in the end: do I feel safe? Yes, more or less. Do I feel welcome? 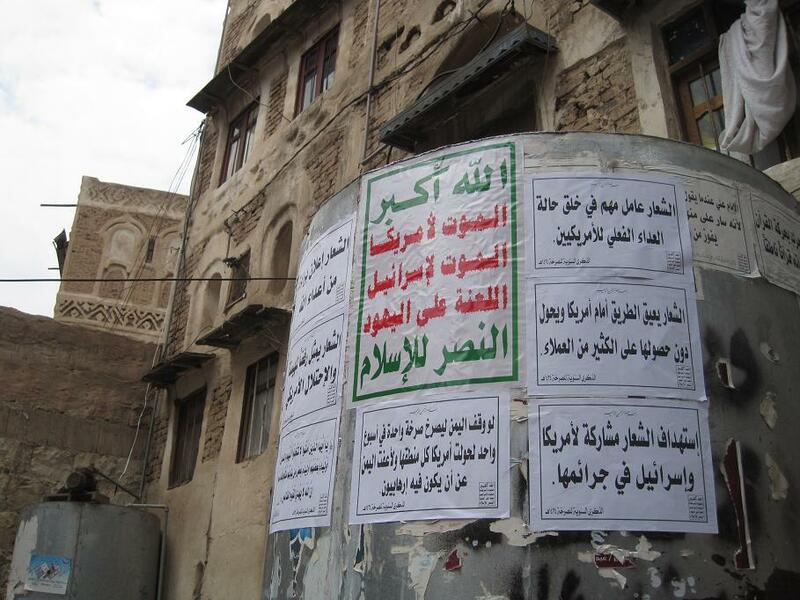 Also yes – more or less, but friendliness somehow doesn't seem to come easy in Yemen. *I always want to answer "from Yemen, probably!" but I guess the irony would be lost on them. Oh well. One day after class I decided to go explore the cultural life of Sana'a. I went to Midan al Tahrir looking for the National Museum, but ended up in the Military Museum. It must have been my lucky day. Entrance: a steep 300 rials ($1,50). Click on the image to see a bigger version. I almost (accidentally) sneaked in for free, until a grumpy officer barked 'must ticket! must ticket!' and sent me back outside. I'm glad he did, otherwise how would I have known that this museum falls under the Department of Moral Guidance, or that it is not allowed throwing the rubbish in? On the ground floor I was greeted by a couple of old English cars that weren't militarily connected, but didn't fit in the National Museum so they were (quite literally) parked here. Outside, in the sheltered yard, there was an Italian plane almost a century old which attracted a lot of little boys with cameras – although judging by the angle of their lenses this tall foreign woman was a more interesting object to photograph than the leftover pieces of the airplane. Aside from that, this floor was room after room after room of weapons, wars, conquests and peace treaties, sometimes with descriptions googletranslated into English. Not all showcases were intact, tempting me to take out a 'gun captored from the Britain Army', which I decided against on account of the 'do not touch'-signs that were almost as numerous as the bullets lying around next to all the weaponry. The second floor was even more exciting, because here the museum branched out into other tasks of the military, such as fighting fires in moonlanding gear and being entertained by singers to keep up morale. There were also some taxidermied birds and a mounted tiger that looked very unhappy. However, I was most intrigued by a room with the name 'Hall of the Seventy Days Epic.' I mean, seventy days of Epic, what more could I want, right? All in all a very educational afternoon, brought to you by – let's not forget – the Moral Guidance Department of the government of Yemen. Shukran! - or: what to wear when in Yemen. Almost all men here wear either a futah (a wrap-around skirt) or a long white dress with a dark jacket over it, with a beautifully decorated belt that holds their jambiyah (dagger) and a scarf wrapped around the top of their head or on their shoulders. Almost all women here wear black from head to toe, including a small black veil that covers their face except for the eyes. I wear something completely different: loose pants and an oversized shirt almost to my knees. My shape is covered, my elbows are covered, my neck is covered – but not my face, nor my wrists, nor my hair. The other day, as I was wandering around the Old City of Sana'a, I caught two little girls staring at me. As I came closer, I heard them debating whether I was a man or a woman. "Is that a woman? Look at her face." "No, no veil – must be a man." "Yes, and pants. Definitely a man." When I passed the stoop they were sitting on, they saw my pony tail. "A woman!" one of them screamed out, after which they both burst into laughter. At Dar el Hajjar, this family (like many others) insisted that my friend take pictures of their children. Some people may find it disrespectful that I don't cover up more, or they may think 'why not' – when in Rome, do as the Romans do. However, Yemeni law does not require women to cover their hair or wear a (black) abaya, so it would make me feel like a hypocrite for following traditions (Yemeni or Islamic) that are not my own, especially after having been here for only one week. I don't mind standing out, for now. It also gives me a special position in society that in anthropological circles is known as the 'honorary male' – a woman who is so clearly different that she is not seen as part of the female world, and therefore allowed with the men. It makes it possible, for example, for the men to invite me into the wedding tent and chew qat with them, something a Yemeni woman would most likely never do. As a Yemeni anthropologist I met pointed out: once I start wearing 'women's clothes' (Yemeni women's clothes, of course), I will most likely lose this position and be expected to behave like women here do. Maybe what I am doing is not fair to the women here. Just because I am a foreigner, I can walk around bareheaded, sit with the men when having lunch in a restaurant (for as many women I have seen on the street, I have hardly seen any in restaurants), and generally disregard the fact that there are very few women out and about after sunset. On the other hand, a Yemeni friend told me that some of his female friends here don't wear a headscarf and get to behave the same way – and that is probably because it is so rare for a Yemeni woman not to wear a veil that it is automatically assumed she is a foreigner if she doesn't cover her head. At Dar al Hajjar, these girls wanted to take pictures of us. We said yes, but only if we'd get one of them too. We did.